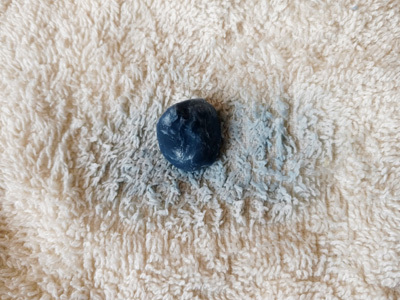 If you’ve ever tried to use indigo to color your cold process soap and ended up with a nasty gray – or worse yet, no color at all – this post is for you! I’ve been there too, which is what drove me to figure out the best ways to get a beautiful color – from a light grayish blue to beautiful teal to dark navy blue. But what about color transfer and colored lather? Can you use too much? Definitely! It should be noted that there are different types and intensities of indigo available from different suppliers and they are used in different ways. I will show you the benefits and disadvantages of each. Let’s start with the different types. There are two different types of indigo: powdered and pre-reduced crystals. 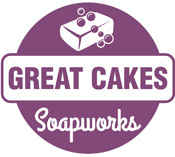 You can purchase the powdered form from several reputable soap supply vendors. (Thanks to the samples provided by Amanda Gail of Lovin Soap, I tested powders from Bramble Berry and From Nature With Love.) The only supplier of the crystals that I could find is Dharma Trading. There are also different intensities of indigo powder. In addition to the powders from Bramble Berry and From Nature With Love, I tested a powder from Botanical Colors. They are not a soap supplier, but market their products to those who dye fabrics. It is an organic indigo powder that is much more saturated than the ones I tested from the soap suppliers. 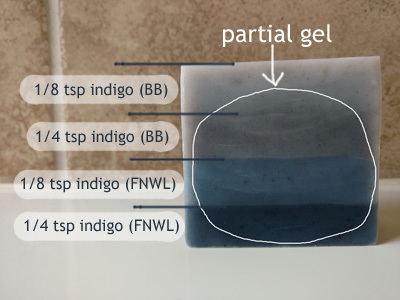 I experimented with four different ways of incorporating indigo in cold process soap. 1. adding it to the hot lye solution, 2. creating strong oil infusions and adding after the soap was mixed, 3. dissolving the crystals in hot water, allowing it to cool and adding it after the soap was mixed, and 4. incorporating an oil infusion in addition to soap that already had indigo added to the lye solution. The powdered indigo can be added either to the lye solution OR in an oil infusion, but the pre-reduced crystals must be dissolved in hot water. Experiment #1: Testing saturation levels with the organic indigo from Botanical Colors using oil infusions. 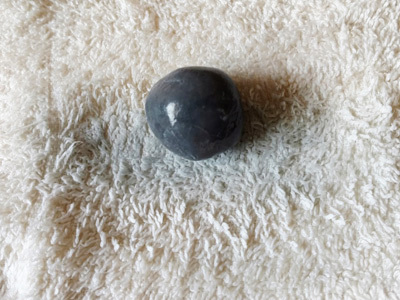 I love that you can treat this indigo just like mica by pre-mixing it with a bit of oil and adding it to portions of soap. It makes it easy to do design work. 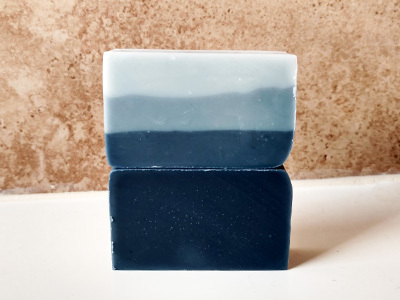 However, the indigo takes a bit longer to incorporate than mica, so it requires you to plan ahead at least a few hours before you want to make the soap. Experiment #2: Testing organic indigo and pre-reduced indigo crystals in the lye solution. 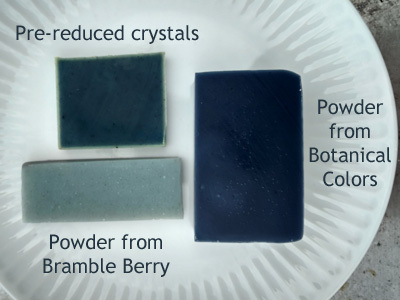 Both types of indigo resisted being incorporated into the hot lye solution – the powdered even more than the crystals. The crystals turned green and also produced a rank odor when added to the lye. By this time, the lye solution is starting to cool, but the indigo is still resisting in both solutions. I even considered that I might have to toss the one with the powdered organic indigo at this point. This is how both solutions looked right before I added them to the oils. The organic powder finally incorporated – mostly. The crystals formed a skin on top and the solution remained a rather bright green. This is the particulate that remained in the bottom of the measuring cup after I poured out the lye solutions. The results of this test are rather stunning! 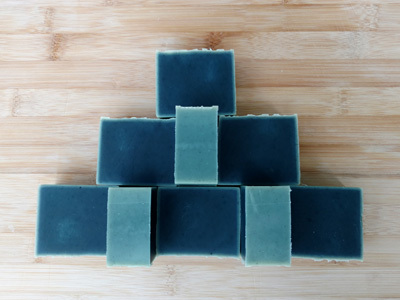 The organic indigo remained a very dark blue – even darker than the darkest layer of the oil infused soap, while using almost half the amount. This dark color definitely colored the washcloth, but fortunately it washed out! I probably still wouldn’t sell a soap colored this dark. The soap colored with the crystals also came out beautifully – a very lovely dark greenish blue, with a lighter teal green around the outside. I think this may have happened because I put this soap in the oven to force gel stage and the heat pushed the green plant material to the outside. Just a theory though. This one transferred just slightly more color than the darkest layer of the BC infusion soap, but not as much as the BC lye solution soap. The indigo washed out of the cloth, but I would still consider using a bit less. The advantage to using this method is the ability to use much less colorant to get a strong color. The disadvantage is that you can’t do any design work. Your soap will be all one color – all one very lovely color though! 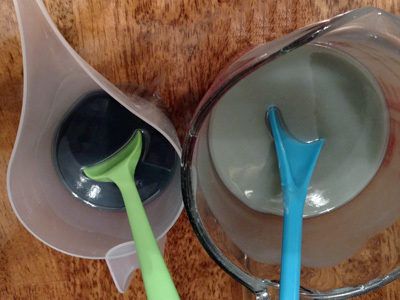 I would also advise mixing the lye solution in a stainless steel container instead of plastic, as the indigo has now permanently stained the plastic measuring cups. 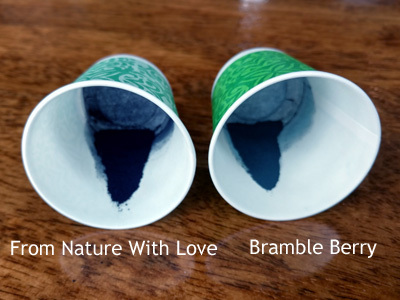 Experiment #3: Testing indigo powders from Bramble Berry and From Nature With Love using oil infusions. I could tell just by looking at the color of the powders from these two different suppliers that the results from this experiment would be different. The intensity of the color is quite different between these two different suppliers! 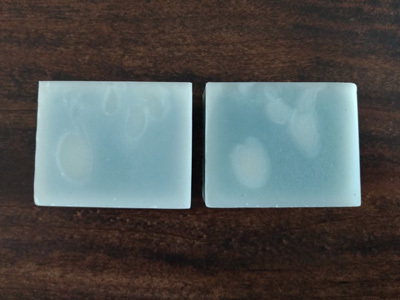 You can also observe the color difference between the gelled and ungelled portions of the soap. Experiment #4: Testing pre-reduced indigo crystals dissolved in water added at trace. The soap wasn’t poured off after each addition, I simply took a photo each time I mixed in more of the solution. Isn’t it the most beautiful Tiffany blue? I just love how it turned out! I also observed that there is some shadowing around the white drop swirls – possibly due to the migration of the water that dispersed the clay or indigo, I’m not sure which. The other observation is the white outline around the outside of this soap, similar to the outline around the soap made with the crystals in the lye solution. Now I’m starting to think it’s because both of these soaps were made in a mold lined with silicone instead of freezer paper. I thought I was finished now, but after seeing the results of Experiment #4, I knew I had to try one more batch using the indigo powder from Bramble Berry in the lye solution to see if I could get a nice blue color. Experiment #5: Testing indigo powder from Bramble Berry in the lye solution. Oil infused batter is much darker! Beautiful gray-green from the lye solution infusion, and dark gray-navy from the added oil infusion. I can see how layering different amounts of oil infusion on top of a soap that is already colored with indigo in the lye solution could produce some beautiful designs! This shows not only the difference in the intensity, but also the shades of greenish-blue to true dark navy. This has been quite learning experience! 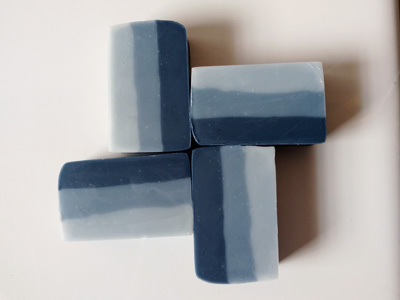 I’ve discovered that not all indigo colorants are the same, and that you can achieve different colors and shades using different methods of incorporating the indigo into the soap. I have much more confidence in my ability to color soap naturally with indigo, and I hope you will too! Amy! It’s so funny that you should share this post today. I actually made a batch of soap this morning with BB Indigo powder. First time for me and I did it because I pulled up you’re pic of the above soap in my Pinterest board. And you’re right, it was greenish blue in the lye pot. I added mine when the lye had cooled at 1 TBS to 36 OZ of oil. When I checked on it later it had turned green albeit this is my recipe with mostly really light oils. Now it’s turning back to a light blue/grey. I’m Pinning this for future reference! Thanks a lot! Thanks Amy indigo is on my shopping list I have not used it and now I know I really need to think about it and have so many choice Happy happy! Very interesting! Thanks for doing all this testing. I have had little experience with indigo, but it’s pretty when done well. Excellent work, Amy. Thank you for running this experiment and sharing the results. @Janie – Oh yes!! I do remember this! Thank you for posting the link here! @Eva – Make sure you check out the link Janie posted in her comment on how Holly uses the indigo from Soap Making Resource! Thank you Thank you…I once made some CP by adding the indigo to lye water. Turned dark gray. This information is GREAT. Thank you Amy! Thanks Amy, very nice comparison. 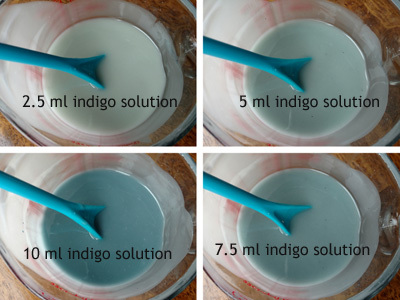 I’ve used indigo powder that I got as a free sample from Soap Making Resource before. I just premixed it in oil and used as if I would an oxide or mica and I got a nice blue jean color. Just something I wanted to share is that I did notice that the color of the bar did fade in the light just like a pair of jeans over time. I tried to attach a picture from my iPad, but no luck, sorry! Hi, I tried twice to color soap with indigo and failed. Once it almost disappeared and second, it stayed green. Is it the powder of the plant Indigofera tinctoria you used in these experiments? And can you also tell me how did you make the oil infusion? Just prepared it before adding to the soap or let it sit for a while? @Catalina – Thanks for your comment! I believe different suppliers have different qualities of indigo powder and none of them really give any more information about what they are selling other than powder vs. crystals. The only information I have is what the supplies give, so if you see something that looks like the outcome you’d like to have, order from that supplier! The oil infusion was just prepared right before adding it to the soap. Hey, I’m a chemist that works with indigo extensively. 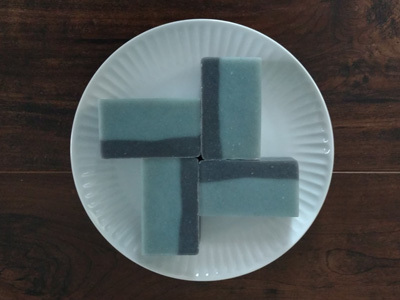 I also make soap in my spare time, so I can explain some of the things you have observed. First off, most indigo you can buy is not derived from plants. It is a synthetic colorant and unless the website specifically states that it is plant-derived, most likely this is what you are getting. Indigo is insoluble in water, and will only be sparingly soluble in most oils, though for soap making you can get away with grinding it very finely and making a suspension in oil. Indigo is applied to fabric by reducing it to a water-soluble form, which is green, dipping the fabric into the dye solution, and then pulling it out and allowing it to oxidize in air back to blue. The pre-reduced indigo is dried in the green reduced form along with some extra reducing agents. This is why it made a strong-smelling green solution- you essentially made a really really strong dye vat, and the reducing agents used with indigo are pretty stinky. 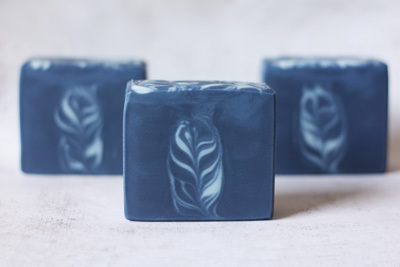 Over time, your teal soap will likely become much bluer as the indigo slowly finishes oxidizing. The natural indigo you can buy online is largely fairly low purity, which explains a lot of the greens/greys people get when using it in soapmaking. I have noticed that indigo in soap fades very quickly. The pink color in the soap is most likely due to indirubin, a red chemical that is present in both natural and synthetic indigo and is formed as a by-product in both pathways. When I use indigo in my soap, I try to aim for the pink color, since it seems to be much longer-lasting. 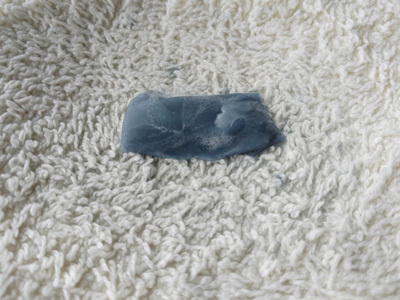 In my opinion, if you want a lasting blue soap you should use a mica. This is so fascinating, Laurel!! Thank you for sharing your knowledge!! Thank you so very much for taking the time to post your experiments. 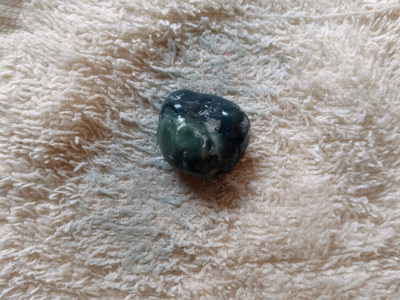 I am using crystals now but was wondering how other indigo’s behaved. Excellent post! Awesome.